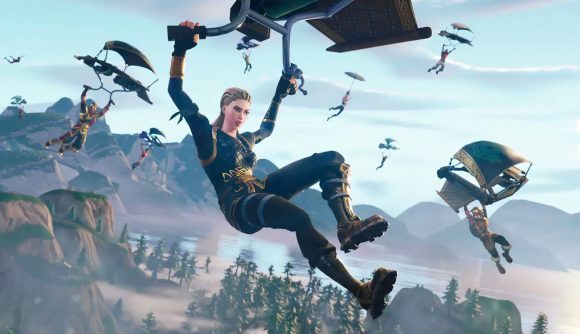 An updated version of Fortnite’s controversial glider re-deploy mechanic is heading to the game with its next patch. The ability was first introduced to the game in November last year, but was swiftly canned after a negative response from the community. It’ll return in update 7.2, but this time as a consumable item. The announcement goes on to explain how the gliders will work. Much like Jetpacks, they’ll take up an inventory slot and can be found at normal loot sources. Once you’ve picked one up, any time you’re falling from a dangerous height, you can deploy your glider, consuming a charge and letting you fly away to (relative) safety. Once you’re out of charges (you’ll start with ten), the item will disappear from your inventory. When glider redeploy was first introduced, it didn’t take up an inventory slot and could be used as many times as you liked. While that made it easier for players to move around the map, it also removed a lot of tension from build battles, as you could just bug out at any time if the going got tough. The itemised version of the mechanic does promise to fix some of those problems, but ten flights (not including planes, rifts, or launch pads) is still quite a lot. Hopefully the changes will have addressed some of the community’s concerns, but I wouldn’t be surprised if we saw plenty of changes over the next few weeks. Epic says that Launch Pads, Rifts-to-Go and Respawns won’t consume glider charges. Instead, they’ll put you in Skydiving mode, which opens your glider automatically at a certain altitude.